After last week’s In The Kitchen With Scotty cooking segment using the fresh berries for my “Newport”, I still was in the cooking mood for more berries… and why not? It is a great time of the year for those fresh berries. While cursing Instagram earlier this week I happened upon a video post from my “Rise and Shine” buddy, Lacey Lett. Lacey had been filling in on the 5 am morning show for Ali Meyer and videoed her co-anchor, Kent Ogle, discussing an amazing a delicious cake his wife had made. Turns out this cake is one of my favorites and perfect for this time of year, and utilized those delicious fresh berries I was still craving. Whole Foods Market’s famous Berry Chantilly Cake has been around for awhile, and is very popular nationwide! The cake seems to have greater popularity in New Orleans, and all over Louisiana, because of the ORIGINAL baker. Chaya Conrad of Bywater Bakery was working for Whole Foods Market while she was in charge of the bakery in her particular store. This is where she came up with the idea for Berry Chantilly Cake. 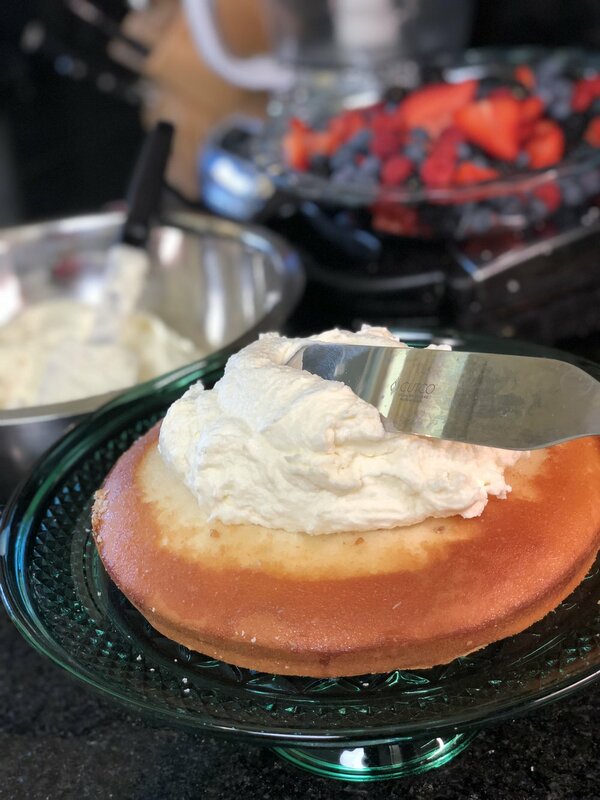 Well, needless to say, the cake idea took off like wildfire, and soon Chaya was traveling from store-to-store training other WFM bakers hoe to make Berry Chantilly. After leaving WFM, Chaya went off on her own and opened Bywater Bakery in New Orleans, which is where I first had the Berry Chantilly… and instantly fell in love. Simple Syrup helps keep cake layers "m" word! Now something I do that is different than the WFM version, is that I use a white almond cake instead of a yellow cake that they use. Try this cake out for yourself this spring and really get into those fresh berries! The berries can me anything you like or have on hand.. it does not have to be what I have in the recipe. Because the cake and idea are versatile you can do any number of combinations, including Lemon curd and blueberry, or even a layer of marzipan for a more European taste. When it comes to this recipe, just make sure you have plenty of sliced or whole berries for each layer, berries are pushed out to the sides of the cake because “every bite counts”, and that you wait at least 4 hours to cut into the cake before serving. By allowing the cake to rest and set up, you will ensure your cake does not break off into chunks when it is cut too early. Easy enough, right? Preheat the oven to 350 degrees. Butter three 9” round cake pans with a parchment insert on the bottom. Cream the butter and sugar. Add the almond extract. starting with the flour add to the butter mixture. Mix long enough to combine. Add a third of the milk and egg white mixture , mix to a batter. Repeat these steps ending up with the flour as the last step. Evenly distribute the batter between the three buttered pans. Place in the oven and bake 25 minutes to golden brown top. Remove from the oven and cool in the pan for 5 minutes, then invert onto a wore rack to cool completely. The cakes must be cooled before icing. Use the simple syrup to moisten the later of cake when icing. Cream the mascarpone, butter, and cream cheese together. In a cold bowl begin beating the whipped cream. Once it becomes soft peaks start sprinkling in the powdered sugar and mix in batches, along with the vanilla, until the cream comes to stiff peaks. Do not overbeat. Fold the whipped cream into the creamed cheese and butter until fully combined. Cut each cake in half evenly if needed, but my three cakes came out the perfect thickness and did not need to cut. Brush the inside with the simple syrup and layer with a generous amount of Chantilly cream. The amount of cream should be the same thickness as the cake. Smooth the cream to the edges an create a nice even layer. Tope with the mixed fruit generously. Repeat the layers ending with the top layer frosted. You can frost the sides evenly or leave it “naked” as I did. DO NOT CUT THE CAKE RIGHT AWAY! It is best to place the cake in the refrigerator and let to “set-up” 4 hours to overnight.